President Donald Trump quietly signed a bill into law Tuesday rolling back an Obama-era regulation that made it harder for people with mental illnesses to purchase a gun. The rule, which was finalized in December, added people receiving Social Security checks for mental illnesses and people deemed unfit to handle their own financial affairs to the national background check database. Had the rule fully taken effect, the Obama administration predicted it would have added about 75,000 names to that database. President Barack Obama recommended the now-nullified regulation in a 2013 memo following the mass shooting at Sandy Hook Elementary School, which left 20 first graders and six others dead. 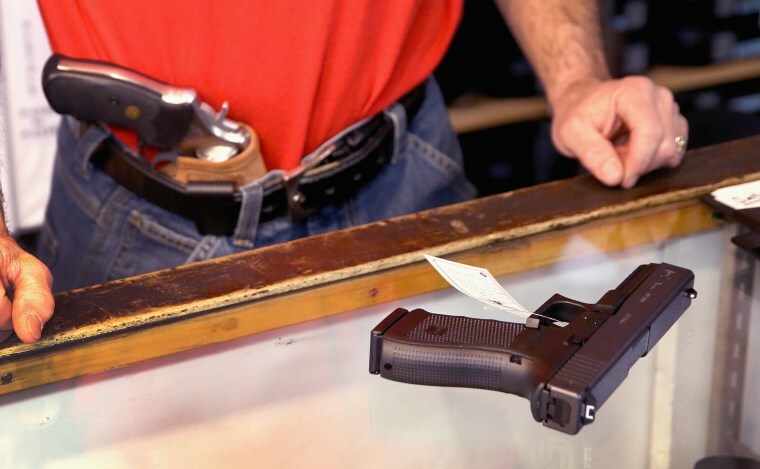 The measure sought to block some people with severe mental health problems from buying guns. The original rule was hotly contested by gun rights advocates who said it infringed on Americans’ Second Amendment rights. Gun control advocates, however, praised the rule for curbing the availability of firearms to those who may not use them with the right intentions. Both the House and Senate last week passed the new bill, H.J. Res 40, revoking the Obama-era regulation. Trump signed the bill into law without a photo op or fanfare. The president welcomed cameras into the oval office Tuesday for the signing of other executive orders and bills. News that the president signed the bill was tucked at the bottom of a White House email alerting press to other legislation signed by the president. Everytown For Gun Safety President John Feinblatt said he expected more gun control rollbacks from the Trump administration. In a statement to NBC News, he called the action "just the first item on the gun lobby’s wish list" and accused the National Rifle Association of "pushing more guns, for more people, in more places." Sen. Chris Murphy, D-Conn., a leading gun control advocate in Congress, called out Republicans over the move. "Republicans always say we don’t need new gun laws, we just need to enforce the laws already on the books. But the bill signed into law today undermines enforcement of existing laws that Congress passed to make sure the background check system had complete information," he said in an emailed statement.